A man named Scott McKinney blew himself up while driving through my neighborhood Sunday. After the explosion, his car veered into a ditch about 400 yards from our house. According to the very limited news reports, he was planning to throw a homemade bomb out the window of his car, but it blew up in his hand instead. He died in the hospital Monday morning. In the preceding days, Suzi told me twice that she thought she heard gunshots in the area behind our house. I’m wondering now if she had been hearing McKinney’s earlier experiments with explosives. Our neighborhood is only half-developed, and there are many empty lots overgrown with weeds and switchgrass. But there’s also a tiny playground and a bus stop, and when I walk through the empty woods I find the abandoned nests of teenage parties — beer bottles, trampled earth, small fire pits. It’s not an unpopulated area. Throw a bomb into the woods here, and you might kill somebody. Without more information, I can’t reasonably speculate about what McKinney intended to accomplish with the bombs he was making. Perhaps he had no objective to his bombmaking besides satisfying a pyromaniacal compulsion. This story, though, invites some associations with other events I’ve witnessed and some fears about new violent sentiments in my community. Through the Internet, I’ve encountered amateur paramilitaries who believe that society is threatened, and that they’ll soon need to defend themselves or their property with deadly force, in circumstances of total lawlessness. I know people who are amassing arsenals, learning to build bombs, stockpiling food, stockpiling ammunition, buying body armor. They expect that, in the near future, the government will betray the people in such a fundamental way that there will be revolt and chaos in the streets. (As some of them see it, that betrayal is already in progress.) Intermingled with warnings and fear of a coming pandemonium, there is also an eager anticipation of the revolution. These prophets of doom actually look forward to a day when all their preparations will prove valuable. They believe that they will have a meaningful role to play when the revolution comes. I was in New York when terrorists attacked the World Trade Center in 2001. From an eighth-floor window in the NYU Department of Photography and Imaging (where I worked), I watched the twin towers fall. I understand through personal experience that there are radical people in the world who want to kill Americans. But there are also mixed-up people here in the American heartland who are so preoccupied with self-defense that they create a new danger all their own. 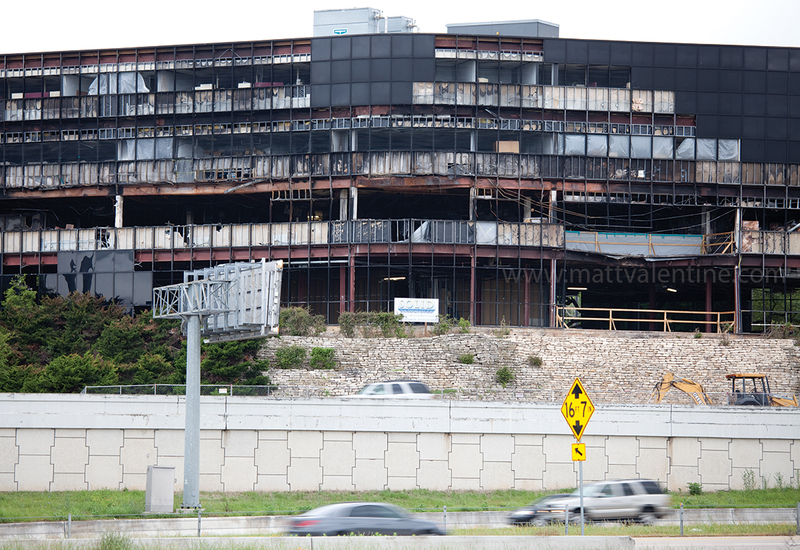 It was dizzying for me to visit the burned out shell of the federal building just off the Mopac Expressway in Austin and see a miniature scale replica of the World Trade Center disaster in New York. Joseph Stack flew his private plane into that IRS building because he hated the American government, and he wanted to make a political statement. The aftermath of Joseph Stack's plane attack on a building in Austin. Now, a Republican Senate candidate in Nevada named Sharron Angle has suggested that unhappy conservatives might turn to “second amendment remedies . . . when our government becomes tyrannical.” She has indicated repeatedly that, if voting doesn’t solve what she calls “the Harry Reid problem”, guns might be the next alternative. Whether in actual application, or merely as a threat, this intimation of violence is the most base form of ‘tyranny of the minority’. Don’t have the votes to get what you want? Can’t persuade the population? Kill the opposition. Or at least intimidate them. It’s the same strategy the Taliban have used in Afghanistan, and it is the fundamental strategy of all terrorism. Whether Angle really means to suggest that people should kill Harry Reid if she loses the election (or whether this is just rhetorical posturing) is barely relevant. When you tell people that government is tyrannical, and that the end is near — and if they believe you — they will make preparations. They develop plans to kidnap and murder police officers. They execute those plots. They fly their planes into office buildings. They learn to build bombs. They ambush and murder civil servants. They blow up federal buildings. They might even practice with IEDs in your backyard. Matt: Marc Lynch calls these “stupidstorms”–post-9/11 narratives about Islam and the “Islamization of America” that echo familiar tropes of the War on Terror. And it’s particularly sad because they’re perpetuated by right-wing politicians who help old “clash of civilizations” narratives to resurface. We’re seeing something similar with the Cordoba House/Park 51 community center in its planning stages in lower Manhattan. Houston radio show host Michael Berry said that if the center is built, people should just bomb it in protest.